Today’s musical interlude: a virtual choir of 5,905 singers from 101 countries. Each filmed themselves singing. Eric Whitacre and his team then assembled those performances into a unified whole. To give you a sense of scale: the video includes 5 minutes of the choir performing “Fly to Paradise” and 8 minutes of credits. Is the Federal Reserve part of the government? You might think so, but you wouldn’t know it from the way we talk about America’s debt. When it comes to the debt held by the public, for example, the Fed is just a member of the public. That accounting reflects the Fed’s unusual independence from the rest of government. The Fed remits its profits to the U.S. Treasury each year, but is otherwise ignored when thinking about fiscal policy. In the era of quantitative easing, that accounting warrants a second look. The Fed now owns $2 trillion in Treasury bonds and $1.5 trillion in other financial assets. Those assets, and the way the Fed finances them, could have significant budget implications. 2. More short-term debt. The Fed needs resources to buy longer-term Treasuries, mortgage-backed securities, and other financial assets. In the early days of the crisis response, it did so by selling the short-term Treasuries it owned. But those eventually ran out. So the Fed began financing its purchases by creating new bank reserves. Those reserves now account for $2 trillion of the Fed’s $2.3 trillion in short-term borrowing, on which it currently pays 0.25 percent interest. 3. Slightly more overall debt. The official public debt currently stands at $11.9 trillion. When we add in the Fed, that figure rises to $12.1 trillion. Bank reserves and other short-term Fed borrowings more than offset the Fed’s portfolio of Treasury bonds. 4. Lots more financial assets. Treasury’s financial assets now total $1.1 trillion. That figure more than doubles to $2.5 trillion when we add in the Fed’s mortgage-backed securities and other financial assets. 5. 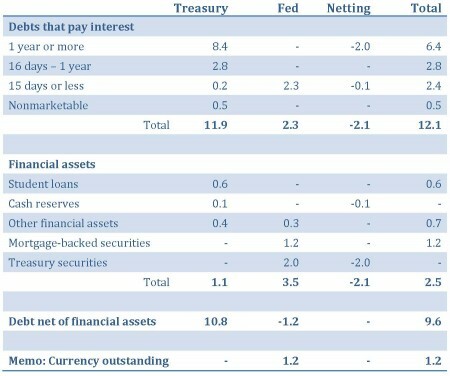 Less debt net of financial assets. The Fed adds more in financial assets than in government debt, so the debt net of financial assets falls from $10.8 trillion to $9.6 trillion. That $1.2 trillion difference reflects the power of the printing press. As America’s monetary authority, the Fed has issued $1.2 trillion in circulating currency to help finance its portfolio. That currency is technically a government liability, but it bears no interest and imposes no fiscal burden. The Fed thus strengthens the government’s net financial position, but increases the fiscal risk of future increases in interest rates. When the Fed buys Treasuries, for example, it replaces long-term debts with very short-term ones, bank deposits. That’s been a profitable trade in recent years, with short-term interest rates near zero. But it means federal coffers will be more exposed to future hikes in short-term interest rates, if and when they occur. This post was coauthored by Hillel Kipnis, who is interning at the Urban Institute this summer. Earlier posts in this series include: Uncle Sam’s Growing Investment Portfolio and Uncle Sam’s Trillion-Dollar Portfolio Partly Offsets the Public Debt. Sources: Monthly Statement of Public Debt, Federal Reserve’s Financial Accounts of the United States, and Federal Reserve’s Factors Affecting Reserve Balances. Max Baucus and Dave Camp, leaders of the Senate and House tax-writing committees, are on the road promoting tax simplification. One goal: cleaning out the mess of deductions, exclusions, credits, and other tax breaks that complicate the code. How big a role the government should play in the economy is always a central issue in political debates. But measuring the size of government is not simple. People often use shorthand measures, such as the ratio of spending to gross domestic product (GDP) or of tax revenues to GDP. But those measures leave out important aspects of government action. For example, they do not capture the ways governments use deductions, credits, and other tax preferences to make transfers and influence resource use. We argue that many tax preferences are effec¬tively spending through the tax system. 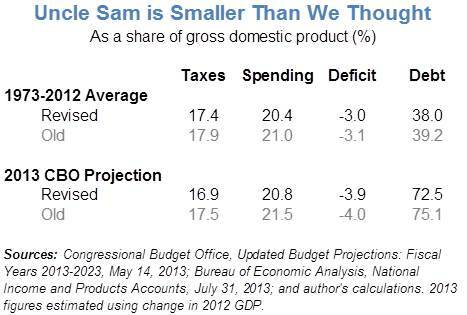 As a result, traditional measures of government size understate both spending and revenues. We then present data on trends in U.S. federal spending and revenues, using both traditional budget measures and measures that reclassify “spending-like tax preferences” as spending rather than reduced revenue. We find that the Tax Reform Act of 1986 reduced the government’s size significantly, but only temporarily. Spending-like tax prefer¬ences subsequently expanded and are now larger, relative to the economy, than they were before tax reform. We conclude by examining how various tax and spending changes would affect different measures of government size. Reductions in spending-like tax preferences are tax increases in traditional budget accounting but are spending reductions in our expanded measure. Increasing marginal tax rates, in contrast, raises both taxes and spending in our expanded measure. Some tax increases thus reduce the size of government, while others increase it. Eric and I first presented this line of reasoning in How Big is the Federal Government? in March 2012. Our latest paper, recently published in the conference proceedings of the National Tax Association, is a pithier presentation of those ideas.